Andy is looking after me brilliantly. 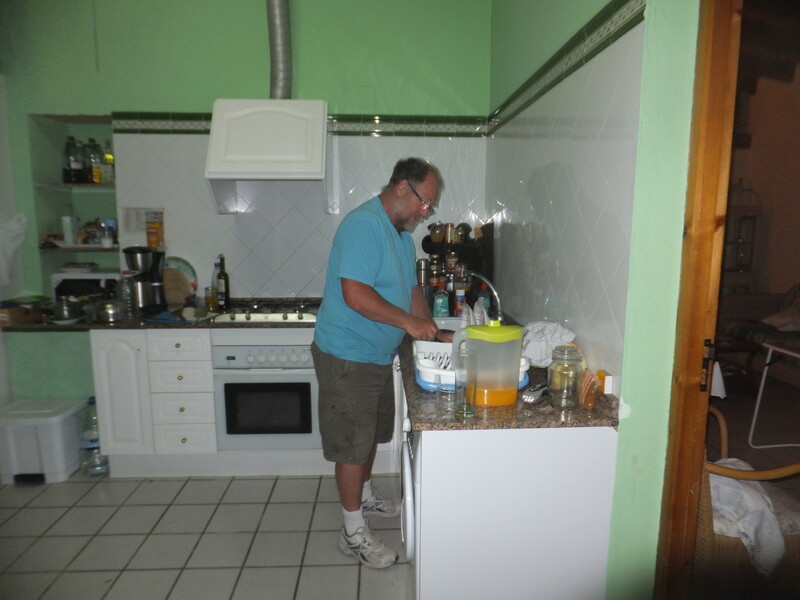 He has cooked delicious meals, cleaned the house and supervised my recovery and rehab. We took the plasters off this weekend and were horrified by the extent of the bruising. Never mind! We will be back to normal soon. I am aiming for a gentle swim in the pool next week. Just a quick note from an internet café to let everyone know that we are still alive! Internet and phone have been cut off as they were being paid on the credit card I lost and had to cancel, and we are having lots of strife getting it back on again. 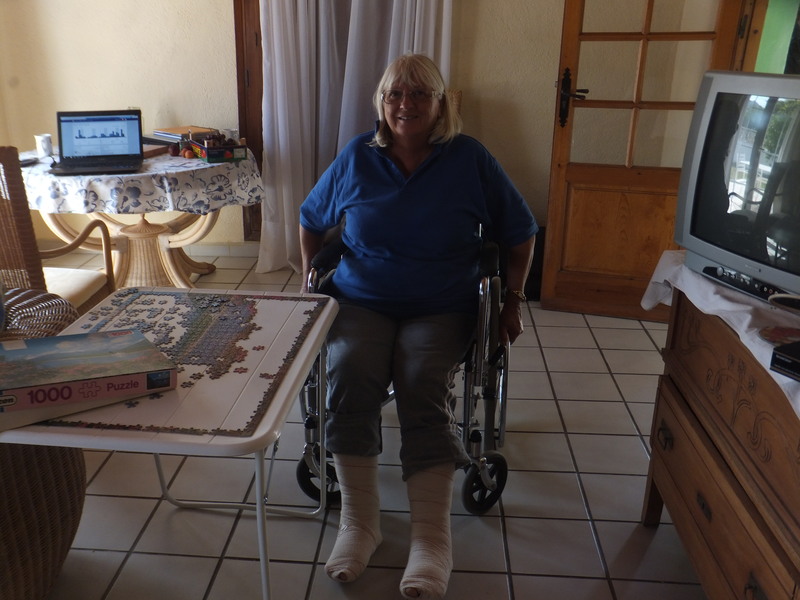 We are taking one of Ann’s legs out of plaster tonight, which she is really looking forward to. Both a bit down at present, the summer has been messed up a bit, and we really have no idea how long rehab is going to take so it is difficult to make plans. We have to be out of the house by June 20th so hopefully Ann will be walking by then. Alun and Ann Price came for lunch yesterday and we had a lovely afternoon. Neither of them would ever score a point from Nicholas Parsons! Spent this morning shovelling two tons of ballast in Alun’s garden. I think I must have accidentally agreed to this in the middle of one of his stories, but it was good to be doing something useful! Hope we are back on line soon. In the meantime Ann’s mobile is about our only means of communication. All the best, Andy. 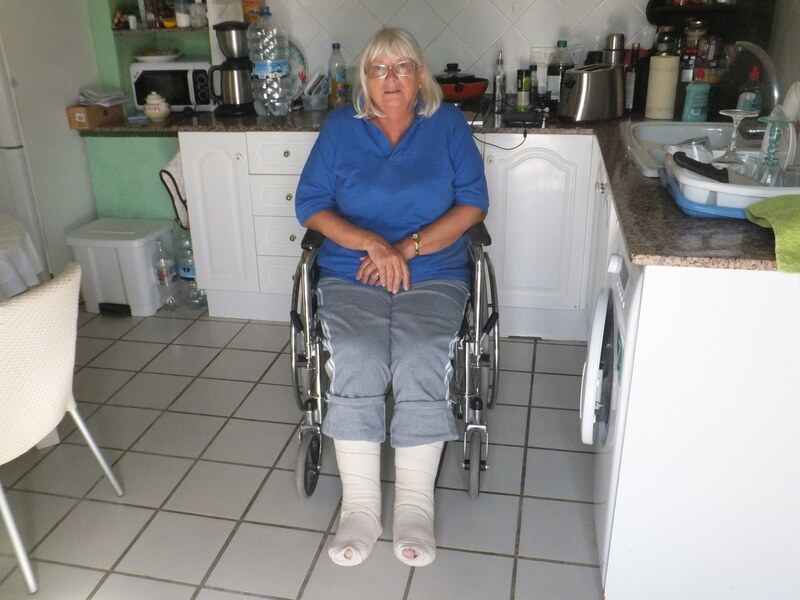 Well, Ann has been in plaster for six days now, and I don’t think either of us are finding it easy! I’m not the world’s best at housework and it seems to take me most of the day. Ann hates not being in control, and watches everything I do anxiously. I think we are both looking forward to returning to the status quo! We were both somewhat surprised that the hospital immobilised both ankles. I seem to remember that the treatment a few years ago was strapping, lots of ice and elevation, and cautious non-weightbearing movement as soon as possible to retain flexibility and strength. Immobilisation seems likely to cause substantial muscle wastage and loss of flexion meaning that rehab starts from a much lower point. If anyone reading this is an expert on ankles please can they drop me a line. We have been quite lucky that the landlady has agreed to let us stay until 21st June. Until Ann is out of plaster and we have some idea of how quickly she can get back on her feet, there is little point in trying to make plans, but the sweep through Southern Spain definitely looks off the agenda for this year. Never mind, there is always next spring, and if one has to be stranded anywhere there are few pleasanter places to be. We are going out for a walk every day, which is good exercise for both of us. I am pushing, and Ann is developing symmetrical muscularity of the shoulders and upper arms by changing her whipping hand every one hundred strokes. All good fun, but some of the kerbs are about a foot high. Have to get back in the kitchen now. All the best, Andy. A slight change of plan! Well, I think we both thought that life had been treating us pretty well lately, but it certainly turned an bit us in the arse today! We had spent most of the day packing, loading the caravan and planning, with an increasing sense of anticipation about leaving here on Sunday. Early evening we decided to go to Calpe for an early evening drink, and unfortunately, while trying to guide me in to a narrow parking space, Ann took a horrible fall off the kerb. We went straight to the health centre where we discovered that Ann’s medical card had gone missing, so we had to pay 190 euros up front to get her seen. 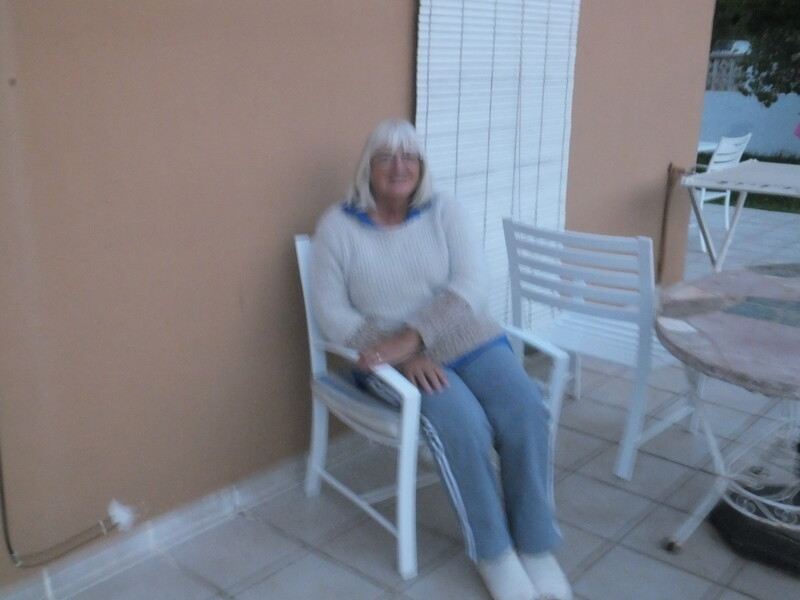 She was immediately referred to Denia hospital, and to cut a long story short (I will relate the full horrendous version some other time) she emerged six hours later with both legs in plaster up to the knees. Both ankles are very badly sprained and swollen, and the doctor insisted on immobilising them completely for at least two weeks. I reckon it will be six to eight weeks before she is walking properly, and then only if she does some serious rehab. She is also very shaken up. We will find out tomorrow whether we can stay in the house we are in for another few weeks. If not, things look like being fairly challenging for a while, and our plans to hit the south of Spain and Portugal may have to go on the back burner. I feel rather as if the gremlin who ripped the window out of the caravan on day two last August has been watching us and decided to pour a little rain on our parade. Still, we’ve been through worse and will probably survive another setback. All the best, Andy.